Starter or side dish, serves 8, marinate for 1 day and night. 1. Grind the peppercorns finely and mix them with the sugar and JOZO 05 extra-coarse sea salt. Chop the dill (including the stems) coarsely and mix them into the sea salt mixture. 2. Place a large piece of aluminium foil on a tray to wrap the salmon. Cut the salmon into two equal halves and lay the pieces on the foil with the skin side down. Spread the salt/dill mixture over both halves of the salmon, then place them on top of one another with the coated sides together. Wrap the foil round them tightly. Then place a tray on top, weighted down by a few cartons of milk or stones. 3. Place the salmon in the fridge and leave it to marinate for 1 day and 1 night, but not more than 2 x 24 hours. The longer the salmon is in the marinade, the saltier it will become. Pour off any liquid that has been released during the marinating process. 4. Unwrap the salmon and brush the excess salt mixture off it. 5. 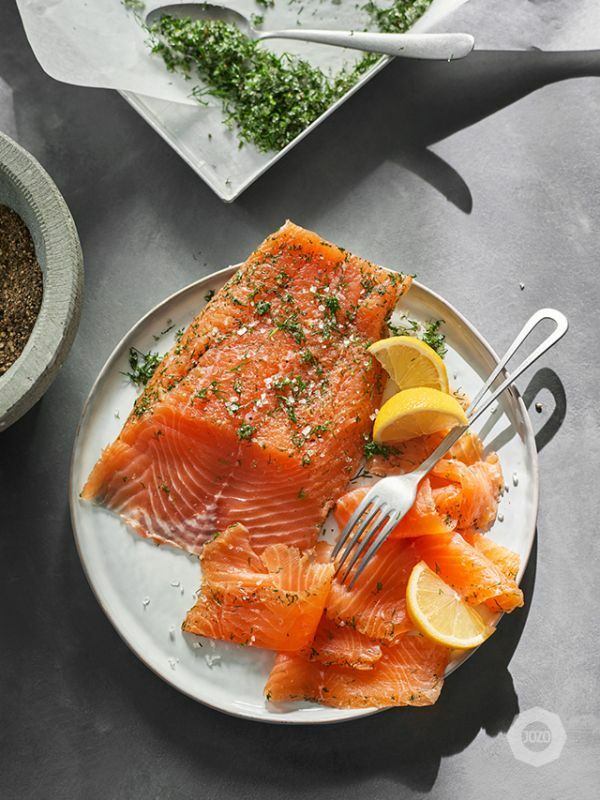 Cut the salmon into thin slices using a carving knife and serve it for breakfast, lunch, as a starter or with drinks, accompanied by toast and lemon. Also delicious with warm bread, bagels or crackers with cream cheese or a little bit of mustard. The marinated salmon will keep for 3 to 5 days in the fridge and freezes well.